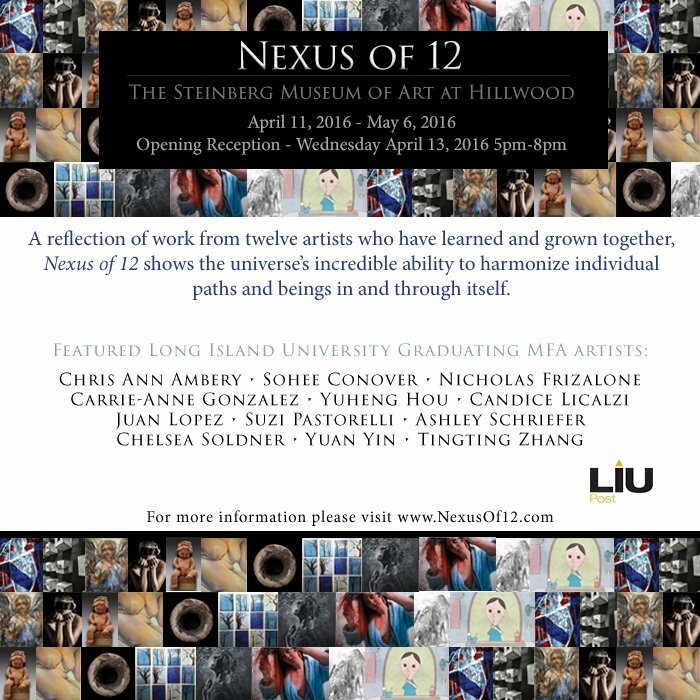 Nexus of 12 is a culmination of several of Long Island’s upcoming and established artists—featuring an array of artwork exploring the depths of human behavior, the essence of life, nature and beyond. The exhibition will be featuring the graduating MFA artists from LIU Post and will be on exhibit from April 11, 2016-May 6, 2016 at the Steinberg Museum of Art. Opening Reception will take place on Wednesday, April 13, 2016 from 5:00pm-8:00pm. The exhibition will feature over 40 works, varying in a wide array of media and visual language—reflecting of the artist’s backgrounds, cultures and experience both in and beyond the classroom. This particular graduating class has exhibited together in several venues, including Studio 5404 in Massapequa as well as the Ripe Gallery in Huntington. As in years past, following their thesis exhibition at the Steinberg Museum on campus, these students will also mount an exhibit at the SIA Gallery in Chelsea NYC. “Every year the MFA graduates select a title for their exhibit and this year is no exception, although it is an exceptional group of students who are very diverse not only in their background and ethnicity, but also in their aesthetic sensibilities and artistic medium,” said Professor Neill Slaugther, Acting Director of Fine Arts and Graduate Studies of the Art Department at LIU Post. Artists participating in this year’s exhibition include: Chris Ann Ambery, Sohee Conover, Nicholas Frizalone, Carrie-Anne Gonzalez, Yuheng Hou, Candice Licalzi, Juan Lopez, Suzanne Pastorelli, Ashley Schriefer, Chelsea Soldner, Yuan Yin and Tingting Zhang. Join these local and internationally recognized artists at the opening reception on Wednesday, April 13, 2016, from 5:00pm-8:00pm at The Steinberg Museum of Art at Hillwood, located at 720 Northern Blvd, Brookville, NY 11548. Works will be on exhibition from April 11, 2016-May6, 2016. For more information about the artists, featured works or the exhibition, please visit http://www.nexusof12.com.